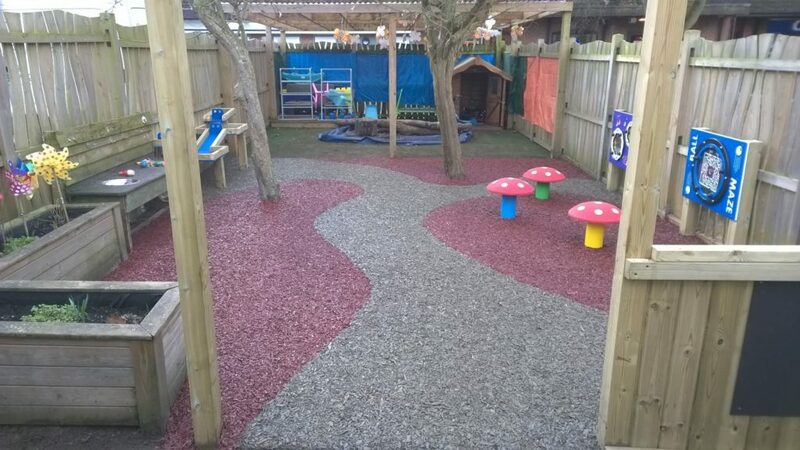 In early 2017, PlaySmart worked with Discovery Timber Play to complete a makeover using JungleMulch, our exclusive brand of Rubber Mulch for a nursery school in bright colours. With a vibrant pathway design making the most of the natural feel of JungleMulch to link up music areas, water-play and raised beds, the overall effect has a real impact. The use of JungleMulch has also allowed them to retain their existing trees as the surface is water permeable and flexes to accommodate tree roots. It’s always lovely to see a great design become a reality and this is a perfect example of that! Alternatively, why not take a look at our guide on JungleMulch?